If you’re anything like me, you’re a blogger who’s completely overwhelmed by looking at Google Analytics. I go visit my charts and I have no idea how to manipulate anything to get it to show my what I want. The words are weird, there’s a graph with a bunch of ups and downs, and then a bunch of things you change or add to get different charts with ups and downs. I still don’t really get it. I’ve seen a bunch of bloggers doing a round up of their “Best Posts of 2016” so that was my aim on this particular trip to Google Analytics. I wanted to find my most popular posts from 2016. It seemed like something that should be easy to find. Well it wasn’t. I tried using the help, but typing in “most popular posts” or “top posts” did not give me any useful search results. In fact the help was really no help at all. I just ended up clicking stuff and eventually I discovered a list of my posts that I could then sort. Cool! After I copy and pasted that list to a Word document I got thinking about what makes a “popular post” – is it just pageviews? Or should I look at what has the most comments? And then you have to factor in your sharing, and linkys and all that other blog promotion that goes on. Obviously the posts that I’ve shared the most have had a lot of views. The posts I personally like would be higher on my list of “popular posts” because I share them more often. And posts that I shared to more than one linky would have more comments than some others. And I have a different stats plugin on my blog that gives totally different readings than my Google Analytics. So off I went to read a few of these “best posts” posts to see if they talk about how they decide what posts were their most popular. I also did a few posts on my social media channels asking how others decided what exactly their “best posts” were. Mrs. Mommy Mack replied to my tweet asking about how bloggers rank their “best of”s. She says she just goes by pageviews as well. After all this research into how people choose their best posts I really have to sit down and look at all the aspects of “popularity” on my blog. I am going to create a “Best Posts of 2016” post, but it’s not going to be right away. Maybe if I was a full-time blogger I could do it, but I’m not. 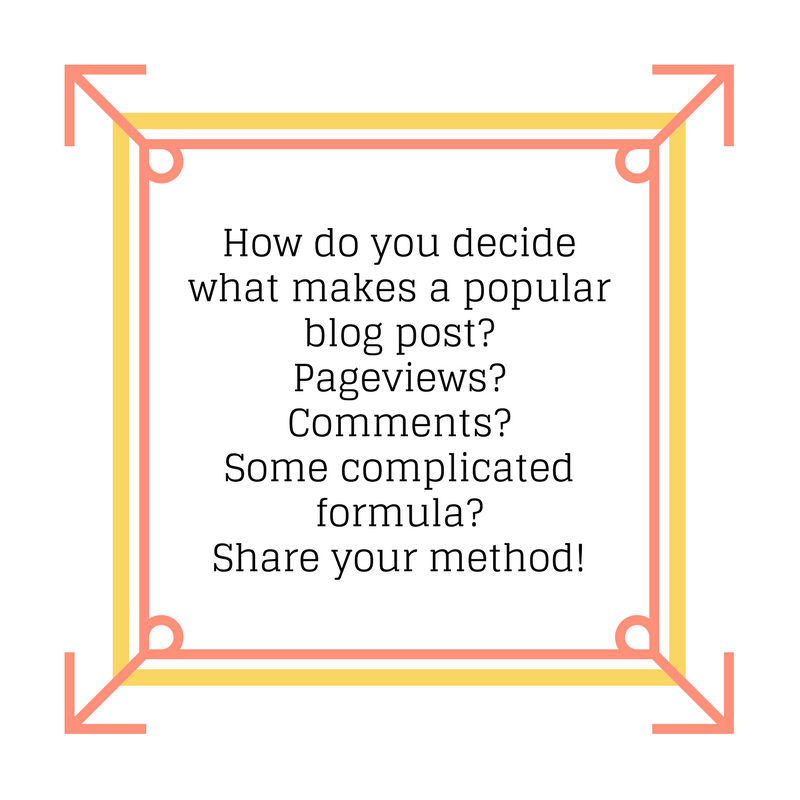 Plus I really need to decide which criteria will work best for me – and then start sorting and listing my more popular posts. I want this post to be a fairly accurate snapshot of my best stuff. That way I can decide which directions to take my blog in this year. Once I get that post up I’ll link to it from here, but you’ll have to wait a week or two! If you have a system for ranking your popular posts, please do share it with me! When I started looking at ranked lists from various sources I got a little overwhelmed. And I really don’t want to put too much math behind this. It’s just a blog post, not a dissertation. So yes, share how you decide what your best posts are – please and thanks! I am often looking for folks to chime in on these crowd sourced posts. Please, join my email list and share your thoughts and opinions with me! I’ve created an update of sorts to this post. Turns out I’ve actually learned a few things about analytics (and Google Analytics) over the last year. Read my post on 5 Things I’ve Learned About Google Analytics! And share (there or here) any tips or hints for reading GA clearly and getting some useful info out of it! I want to know this too! When I had Blogger, it was easy to see which posts had the most views, comments, etc. Now that I have switched, I am relying on Google Analytics…and it is so confusing! Thanks for including my quote first woop!!! Ok I seriously want to make a spreadsheet to calculate this now. Um spreadsheets are work related right? Hi Jess, I get totally overwhelmed by Google analytics too. I have two stat readers as well that never show the same results, but Google seems to be the ones that everyone is after. I actually don’t pay too much attention to what appear to be my best posts as like you said it depends on how much PRing is put into them. When I was partaking in more linkups I had many more comments and page views on those posts than I do now. If you ever figure out how to use Google analytics and can put it into laymans terms I bet that would be one popular post! I may have to look into that plugin. Thanks for the info! I’ve never looked at Google Analytics. I just compiled my list from looking at my Jetpack statistics. WordPress usually send an end of year report too but for some reason I didn’t get one this year. Good luck with Google! I’d be interested to see something from WP specifically. I have browsed my JetPack but I only installed it a few months ago so it doesn’t have all my stats. Thanks for your input Catherine! Ohh analytics make my head hurt. I tend to go by pageviews. I need some other way of working it out though as my google analytics account stopped working for a while. Sigh. The more I read about this, the less I want to make a “best of…” post. There seems to be no easy way to sort posts. I’m very grateful for all the input I’ve gotten so far! Totally agree that there are so many different ways to rank your blog posts. I would try and have a combination of them all, more of a blended figure. Also I usually look at unique visitors over pageviews because pageviews are not as accurate as people click back and forth from Linkys or have tech issues. Thanks for sharing with #stayclassymama. There are so many things to consider! I may give up on the idea of creating a “best of” post…I’m still thinking about it – maybe for my one year blog-iversary. I’ve quickly come to the realization that a “best of” post won’t come about easily. There are so many factors! Thanks for weighing in! Sorry to hear that. Maybe once I learn a bit more I will write another post about analytics!